University of California, Berkeley, researchers have found that three carbon structures recently created by scientists in South Korea and Japan are in fact schwarzites, an elusive carbon structure which researchers predict will have unique electrical and storage properties like those of carbon nanotubes and graphene. The new structures were built inside the pores of zeolites, crystalline forms of silicon dioxide—sand—more commonly used as water softeners in laundry detergents and to catalytically crack petroleum into gasoline. Called zeolite-templated carbons (ZTC), the structures were being investigated for possible interesting properties, though the creators were unaware of their identity as schwarzites, which theoretical chemists have worked on for decades. UC Berkeley postdoctoral fellow Efrem Braun and his colleagues identified these ZTC materials as schwarzites based of their negative curvature, and developed a way to predict which zeolites can be used to make schwarzites and which can't. 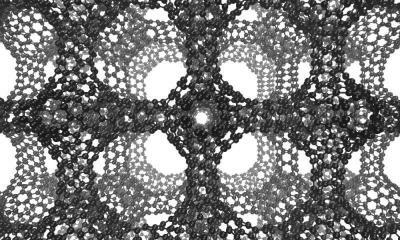 "We now have the recipe for how to make these structures, which is important because, if we can make them, we can explore their behavior, which we are working hard to do now," said Berend Smit, an adjunct professor of chemical and biomolecular engineering at UC Berkeley and an expert on porous materials such as zeolites and metal-organic frameworks. In the 1880s, German physicist Hermann Schwarz investigated negatively curved structures that resemble soap-bubble surfaces, and when theoretical work on carbon cage molecules ramped up in the 1990s, Schwarz's name became attached to the hypothetical negatively curved carbon sheets. "The experimental validation of schwarzites thus completes the triumvirate of possible curvatures to graphene; positively curved, flat, and now negatively curved," Braun added. Researchers should be able to pack unusually large amounts of electrical charge into schwarzites, which would make them better capacitors than conventional ones used today in electronics. Their large interior volume would also allow storage of atoms and molecules, which is also being explored with fullerenes and nanotubes. And their large surface area, equivalent to the surface areas of the zeolites they're grown in, could make them as versatile as zeolites for catalyzing reactions in the petroleum and natural gas industries. Braun modeled ZTC structures computationally using the known structures of zeolites, and worked with topological mathematician Senja Barthel of the École Polytechnique Fédérale de Lausanne in Sion, Switzerland, to determine which of the minimal surfaces the structures resembled. The team determined that, of the approximately 200 zeolites created to date, only 15 can be used as a template to make schwarzites, and only three of them have been used to date to produce schwarzite ZTCs. Over a million zeolite structures have been predicted, however, so there could be many more possible schwarzite carbon structures made using the zeolite-templating method.